Disclaimer: I am NOT a financial advisor. All investments are subject to risk and are not insured by the FDIC. I hold no responsibility with any investment decisions you make based on any of my articles. 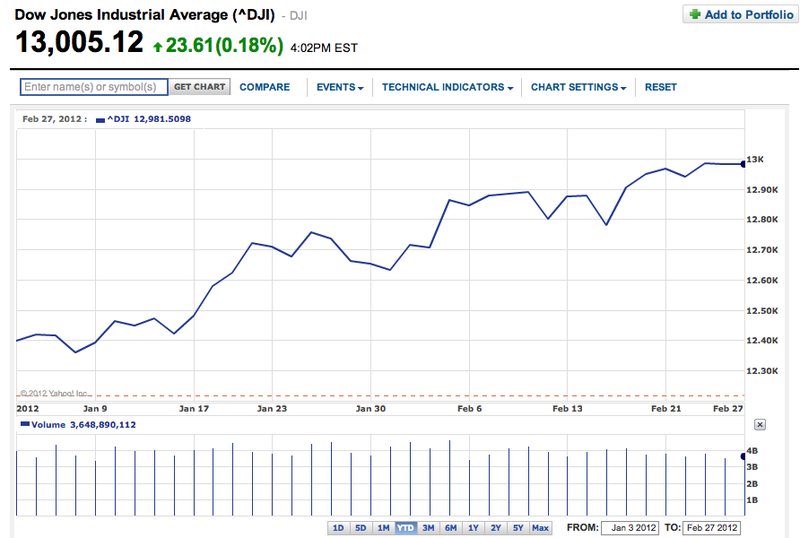 I first made a post about starting your retirement fund on January 26, 2012. The take home message from my previous article: If you’re working right now, you need to be thinking about retirement. Have you opened your Roth IRA yet? I transferred my previous Roth IRA over from a brokerage account to Vanguard on December 18, 2011. I haven’t looked back since. I don't have to deal with annual maintenance fees anymore. More importantly, I have much more control of my finances. Who better to look over your money than yourself? Today, the Dow closed above 13,000 points (13,005.12) for the first time since May 2008 and the S&P 500 closed at a milestone 1,372.18 points. The Dow Jones is a stock market index of 30 large publicly owned companies. The S&P 500 is an index of 500 large US owned companies. 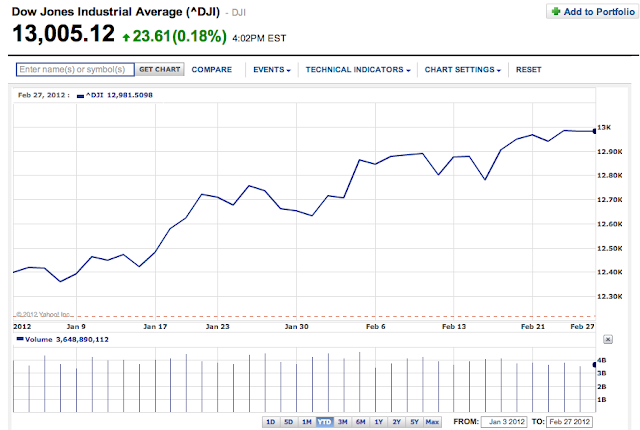 These are the two indexes most commonly used to track the American economy. The S&P 500 is now up about 9 percent since the start of the year. In a period of 2 months, I made $712.15 just for parking my money inside my Roth IRA. My money is being put to work for me with the least amount of effort possible. Don’t forget, I do not pay any taxes when I withdrawal money from this account in the future. Let me ask you again, have you opened your Roth IRA yet? Which fund am I currently investing in for my Roth IRA? edit: this fund may not apply to you based on your age range / risk aversion / investment goals. The current YTD return of VTIVX is 10.10%; what interest rates have your basic checking or savings accounts yielded? Yes with some stocks you can make much more with one investment, but you could also lose it all. Amazon stock has increased 25% year after year. Other stocks like Apple have returned much more. With high reward comes very high risk. If you only own one stock and then it tanks, you can go broke overnight. On the other hand, if you choose to invest in an index fund, your portfolio is automatically diversified with hundreds to thousands of stocks in the same basket. You’re reducing your risk for a steadier payout. As you can see, VTIVX's current manager has been with the fund for over 9 years. The stock market is bound to go up and down over time, but the trend is always up. Historically, we’ve seen huge drops in the stock market: from the great depression, to the dot-com bubble, to 9-11, to the housing crisis, the downgrade of our triple A credit rating system and recently to the Greek debt crisis. Where is the market now? It’s up. When should you start investing? Now. The deadline to contribute (up to $5000) for the year 2011 is on April 17, 2012. Focus on long term performance and not short term market fluctuations. Studies find that a buy-and-hold strategy is better than market timing (trying to figure out when to “jump in or out” of stocks and bonds.